If you can’t decide which orchid you prefer, or you just enjoy the thrill of not knowing what to expect, let us make the decision for you. 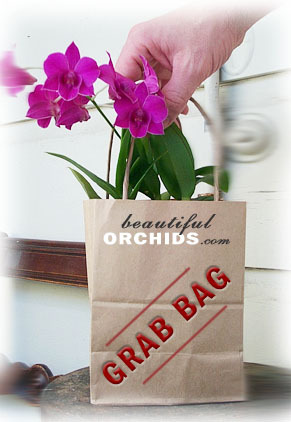 With the Grab Bag, we offer you the opportunity to purchase orchids we have in limited supply but are still willing to part with. The collector might receive anything from a Phalaenopsis schilleriana to a Maxillaria variablisistwo of our more exotic and rare orchids. The new enthusiast, on the other hand, might receive a plant more suited to the initial joys of orchid discovery, such as a Vanda wirat or a particularly special Masdevallia bella donna. If you have a particular flower in mind and just haven't been able to locate it, let us know. E-mail us your wish list and, with the help of all of our California suppliers, we'll do our best to find just the flower you're looking for.